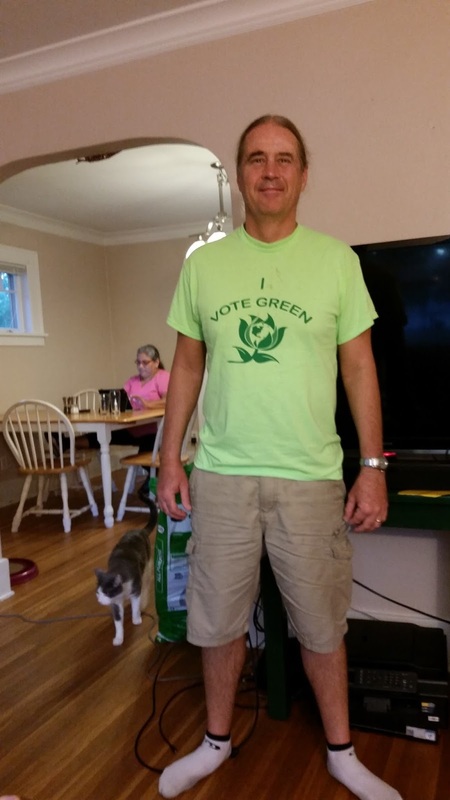 What we vote doesn't matter, except to inform our masters how to best manipulate us. Thinking we are deciding stuff works pretty well, overall. We get to have a much higher opinion of ourselves than most herds of cattle. We don't even think we're being herded. We think WE get to decide things for the herd. The latest example that I see is the friends and family who tell me very gravely that we have to vote for Clinton or we'll get Trump, who is Hitler. Trump is sure channeling the right-populist energy that Hitler and Mussolini channeled. Hillary Clinton is what she is, and represents the post-Reagan status-quo, neocons and Goldman Sachs. There is no lesser evil, and we will be told what we think, what we've decided, and what we will be doing about it in the crisis. 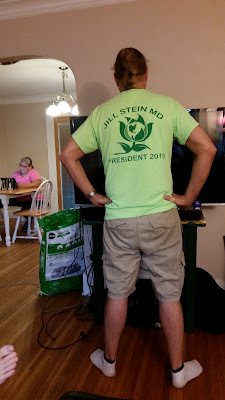 Knowing that Dr Stein will never be elected President, and that she would have to do what she is told by the Deep-State, same as Obama does, I have spent my own money in the futile human act of making #100 of "I VOTE GREEN, JILL STEIN MD PRESIDENT 2016" t-shirts. To save money, I model one myself below. Charles Hugh Smith has an excellent analysis here, and I won't ask him to divulge his sources. He says the Deep-State, our real government in this great empire, is divided, and that Hillary Clinton might become more of liability than even Donald Trump, as the militarism-only neocon-driven foreign policy keeps backfiring, unraveling and getting more acutely insane. Tom sent me an article, and there are many with the same video of Hillary Clinton having a seizure on-camera. A couple are included. Hillary had a closed head injury, with loss of consciousness, right temporal lobe damage and a right temporal area venous sinus thrombosis (blood clot) in 2012. The bizarre and sudden facial and body movements, and eyes briefly crossing as right eye turns in, are typical of Temporal Lobe Epilepsy and the Partial Complex Seizures it produces, which result in sudden bizarre behavior of many sorts. There have been 5 Clinton-related deaths in 6 weeks (so don't bench-press without a spotter after testifying against Clintons), but this one may have been the DNC staffer who leaked the Clinton emails. Julian Assange comments in a painfully-constrained fashion about the murder of Seth Rich, who was shot multiple times in the back, and not robbed of obvious valuables, in his very safe Washington, DC neighborhood. Assange/Wikileaks offer $20k reward for info leading to the murderer(s). Jenny and I have been visiting family in New York State and rural Massachusetts, for a little over a week, so no news blogs. Easing back into it tonight.